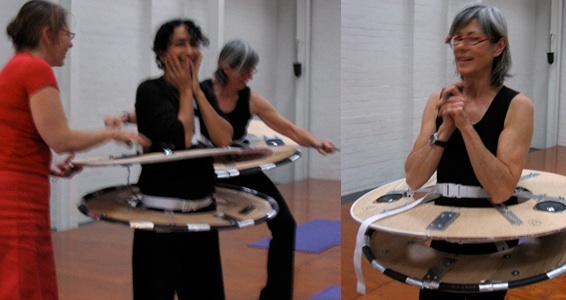 hipDisk was designed to inspire people to swing their hips and explore and extend the full range of movement available to them through a simultaneous, interdependent exploration of sound. In creating hipDisk, the interest was to move beyond limb- and digit-triggered switches and explore full-body movement for actuation. The resulting body-instrument interconnects choreography and composition in a fundamental way. An ensemble of performers known as the hip diskettes are working on a performance of The Girl From Ipanema. As an ensemble they can play chord structures, harmonise, provide counterpoint, so develop increasingly complex hipDisk compositions. at the 2008 Australasian Computer Human Interaction Conference (OZCHI). The paper, hipdiskettes : learning (through) wearables can be viewed here. Genevieve Messenger, Lizzie Pogson and Miyuki Jokiranta for their commitment, curiosity, expertise and playfulness. Their hard work and patience made this research possible.